The frame clip art set includes 85 png images in a 5 light color scheme: pink, blue, purple, orange, and gray. 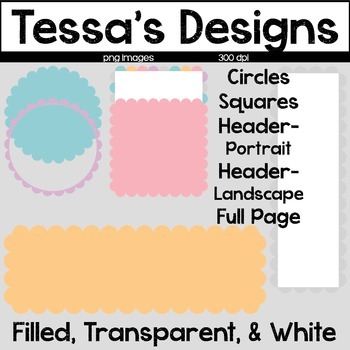 Frames are in full page (8.5"x11"), header for portrait layout, header for landscape layout, square, and a circle. Each frame is included with a full color center, a white center, and a transparent center. Bonus rainbow frames are included with in the white and transparent centers! These are perfect for product covers layered on top of digital background paper. The graphics also work great as labels and tags.